My overall stay was incredible. The hostel is located in a great location and the staff were very helpful, especially Matt and Fabien, they provided some great insight into the city and were extremely helpful. If I return to Bariloche I will definitely stay at this hostel. 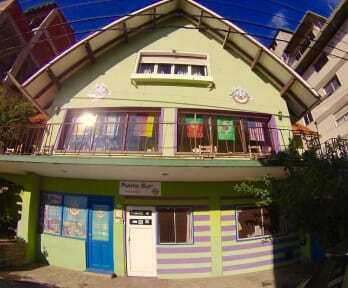 A nice hostel that is walking distance from all that you need. The staff were very helpful and gave us lots of information. It has a kitchen that closes late in the evenings especially for when you return late. There are lockers in the room. A simple breakfast is included. We are only stay one night but the staff was really halpful and it’s the the best value for money in Bariloche. Staff was great, and location was excellent. Kitchen well provided, and nice breakfast (home made bread and home made marmalade). I had a problem with the shower, and they called a plumber right away, but it was not solved so we had to use the faucet instead and it was a bit uncomfortable. The hostel was really warm and cozy, and that was nice. Please notice that there are a lot of stairs, so if anyone has any mobility issue, it is not suitable. The staff were so kind and friendly, really really helpful. The hostel is a bit further away than some others from the centre and looks a bit old and rickety but we enjoyed our stay there. The toilet stopped working while they were there but they sorted it very quickley once we'd told them. They did not want us to cook breakfast for ourselves because they served from there bread and jam. The toilet broke twice and were smelly. Some members of the staff made us feel like we are not so welcome and need to ask in order to do anything. Great location. Nice common place. Nice staff and open dining area/ living room / deck, but my biggest complaint was how disgusting the bathroom and showers were. The bathrooms in general were covered in mold and the drain in the shower became clogged within 30 seconds of showering, causing the little bathroom to begin to overflow almost immediately. I’m guessing the bathroom space was originally designed to be a closet.. maybe it needs to go back that way and have a large communal bathroom for all rooms instead? Too many volunteers with dubious hosting skills, bad facilities, disappointing “breakfast”, bad location. There are much better hostels in Bariloche. The hostel is completely run down. On several occasions we were electrocuted when leaving the bathroom after a shower trying to turn off the light. Most of the staff were not helpful when guests needed assistance, definitely were not understanding. No toilet paper, shower had no isolated area. Water leaks. Holes in doors. And more.